Sterling Systems & Controls custom engineers and manufactures many types of process control systems and automation systems. This is done for our material weighing systems, bag filling stations and bulk unloader systems. In addition, Sterling Systems works cooperatively with many OEM integrators of systems for handling and processing powder and bulk solids. Process controls for OEM’s. One such system is shown here. 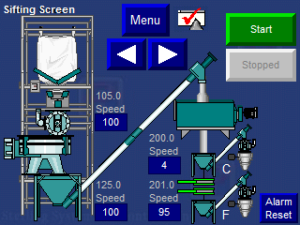 This system included bulk bag unloading, and material processing, weighing and handling. 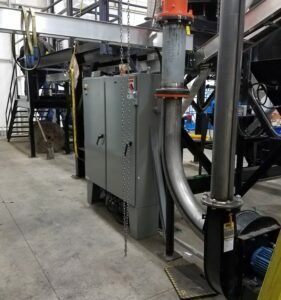 For example, in this system bulk bags are unloaded into a material sifting operation.In the automation system the Sifting Screen graphically displays the equipment used in the sifting process. The status of each piece of equipment is indicated on the screen by color. If the equipment is running in automatic mode, it will be light green. If it is turned off, it will be dark gray. If it is running in manual mode, or the system determines that the equipment is running, but the control system is not requesting it to run, the equipment will be light blue. If the equipment is faulted, it will flash red to white. If the equipment is idle in automatic mode, it will be a seafoam color. 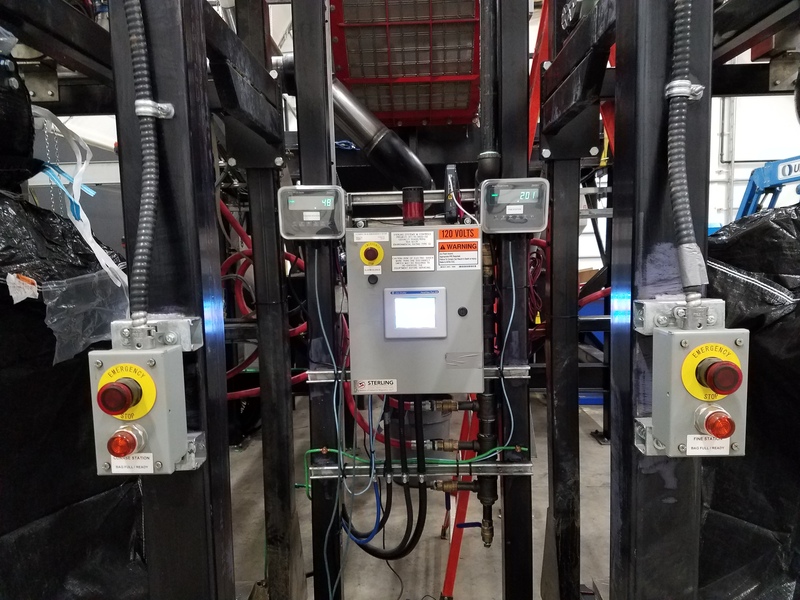 Sterling Systems provided both the electrical controls with a VFD control panel and the automation system control panel. Sterling is capable of custom engineering almost any process control system and manufacturing all control panels required. Sterling Systems can provide UL and/or CSA approved panels. If you are an OEM we want to work with you, give us a call!